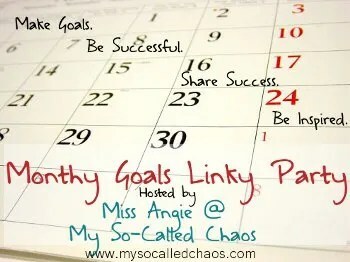 I LOVE this Linky Party!!! Please, anyone who blogs, join in! I’ve checked up on the past months over at My So-Called Chaos and you will not be sorry you joined in this one! I am going to do it on my spiritual journey blog too, as that one will be a different set of goals! Walk 5 times a week, rain or shine if outside, or inside on the treadmill, but walk and be up to 3 miles a day by the 30th of the month! Drink 64 ounces of water every day (I’ve been easily dehydrated for months). Healthy snacks, if I must snack, during the day. Start measuring portions on all food! Stop over eating. 8 new team members to my Avon business by the 30th. Okay those are realistic and very much needed! Check back for a success report periodically and at the end of the month. Those are great goals! You can totally do this, and I need t be healthier too! It’s so hard! Great goals! Try eating on smaller plates, makes portioning a lot better. I eat off of a salad plate for every meal. Hard to overeat when it doesn’t fit. Thanks for the tips and for stopping by!